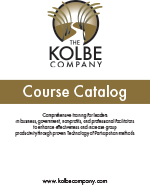 The Kolbe Company produces programs that value and stimulate participant involvement leading to creative solutions for our customers. We offer a broad array of training programs for every budget. All programs are facilitated in an interactive way that helps participants tap into their own wisdom and find their own solutions. Client needs, research, and experience guide the material presented, normally a variety of tools and strategies that have proven results in similar situations. We use the best practices in adult learning theory to teach facilitation methodologies. The material presented has immediate usefulness, the techniques and examples are relevant to the learners’ lives, the training environment is comfortable, and all feel safe to participate. The presentations are engaging and participants have ample opportunity to share their experiences, wisdom and ideas. Each training has demonstrations, opportunities for practice, regular feedback and time to plan how to apply facilitation skill to their work. Each course has a complete manual and resource materials. Please see the following link for a catalog of courses. For a complete listing and links to more information, visit the Catalog page. ToP® Facilitation Methods & ToP® Strategic Planning courses are eligible for continuing education credit by National Commission for Health Education Certification (13.5 CECH) and American Institute for Certified Planners (14.5 CM). Click link for downloadable PDF of Course Titles.